This Site is available only for your personal, non-commercial use. You may not copy, reproduce, republish, post, distribute, transmit or modify in any way all or any part of this Site. You affirm that you are either more than 18 years of age, or an emancipated minor, or possess legal parental or guardian consent, and are fully able and competent to enter into the terms, conditions, obligations, affirmations, representations, and warranties set forth in this Legal Statement, and to abide by and comply with this Legal Statement. In any case, you affirm that you are over the age of 13, as this Site is not intended for children under 13. 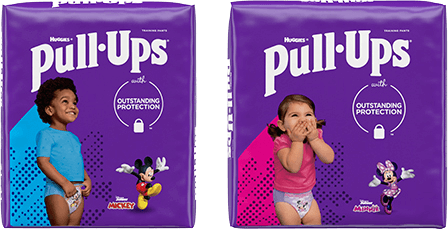 If you are under 13 years of age, then please do not use the Pull-Ups.com Site. Kimberly-Clark is eager to receive your comments and answer your questions about our products and our company. If you have an idea for one of our products or for a new product, we can only accept those ideas within limited, structured programs that we have established (for example, the HUGGIES MOMINSPIRED grant program). This is for your protection and for ours. By accepting external ideas only through structured programs, we hope to avoid misunderstanding about the origin of ideas between you and Kimberly-Clark. Kimberly-Clark hereby grants you permission to use this Site as set forth in this Legal Statement, provided that your use of this Site is solely for your personal, non-commercial use. You may not copy or distribute any part of this Site in any medium without Kimberly-Clark's prior written authorization. In addition, you may not alter or modify any part of this Site other than as may be reasonably necessary to use this Site for its intended purpose.